Gear up for the spring season with hats from Walker Ware. For the month of March, all of our hats are discounted 20%. Use the code WALKER CAPS at checkout to receive 20% off all hats. Gear up for the spring season with hats from Walker Ware. For the month of March, all of our hats are discounted 20%. Use the code "WALKER CAPS" at checkout to receive 20% off all hats. If you are getting ready to start with spring cleanups, make sure to have a Walker A10 Dethatcher on hand. This efficient, easy-to-use attachment makes it easy to lift up thatch and collect it all in one pass with Walker's exclusive GHS vacuum action - allowing lawns to get needed moisture and light for a strong growing season. The Dethatcher also has a foldable handle, and an optional wall or trailer mount is offered by ordering P/N 6606-11. Not yet a subscriber to the Walker YouTube channel? Give it a look here for the latest Walker videos, including new instructional videos for 2019. Not sure what Walker you are interested in for spring? Request a 2019 Walker Product Catalog to be mailed free of charge, putting information on each model in your hands. 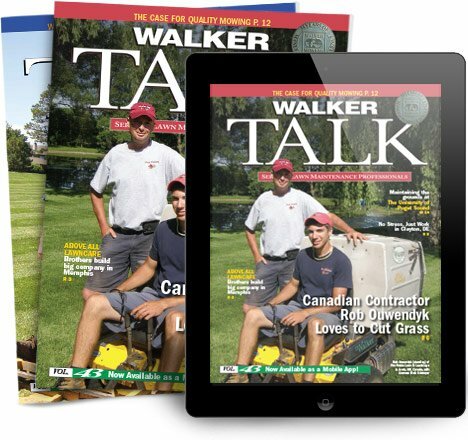 Request your catalog here, or you can always see the latest information at walker.com.